Weighing in after a long, hard day's work. The daughter of a northern industrialist millionaire—she herself having never seen a cotton field—promised to take a year off from her international travels and revolutionize the cotton picking industry by forcing Charterene’s methods nation-wide. As fate would have it though, when the crowds gathered to watch the champion in action, facts emerged. First, Charterene selected the best row in the field to pick. Further, it had been prepared ahead of time by young boys who removed the inferior and rotten bolls. Then the farmer gave Charterene a head start. Sure enough though, she picked a quarter of a pound more cotton than the nearest competitor. “Proof,” cried the writers. “Out,” said the owner to the manager who had doubted Charterne’s methods. “I’m on it,” said the industrialist’s daughter, instructing the Governor to proclaim in “Charterene Day” in the state. The industry changed. 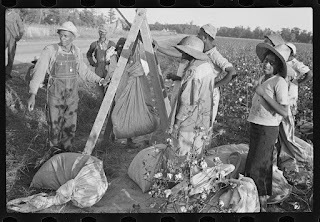 Cotton fields weren’t picked clean like before, only enough to maximize profits. Bolls not meeting minimum standards remained in the heat-soaked fields to rot. Soon, America had to import high-quality cotton from India.